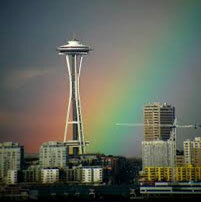 Seattle attraction areas, Boeing factory tours, many others attraction areas. Boeing Museum Tour/ Boeing Future of museum factory Everett tour. Seattle Center Space Needle tour. Kerry park Puget Sound view. Seahawks and Mariners Stadium tours. Experience Music Project Museum (EMP). Ballard Locks, Woodland park Zoo. Pacific Science Center/ Children Museum. Olympic Sculpture Park / Waterfront Park. Seattle Art Museum (SAM) / Seattle Great Wheel. Museum of History & Industry. Burke Museum of Natural History Culture Museum. Seattle Aquarium pier 57/ Argosy Boat tour. We offer small to large city tours. Bruce and Branden Lee Cemetery. Jimmy Hendrix cemetery Renton, WA. Chateau Ste. Michelle/ Colombia Winners. Seattle and surrounding cities have beautiful scenic tours. The third largest Mountain in US It’s highest: 14,409 above Sea Level. Mount Rainier is the 5th oldest National Park.